Saving The Day... With Crafts! : Tres Holizaar is THIS SUNDAY Dec. 5! 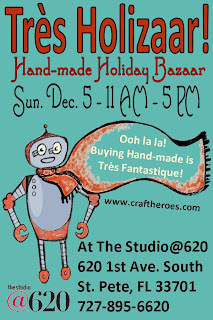 Tres Holizaar is THIS SUNDAY Dec. 5! 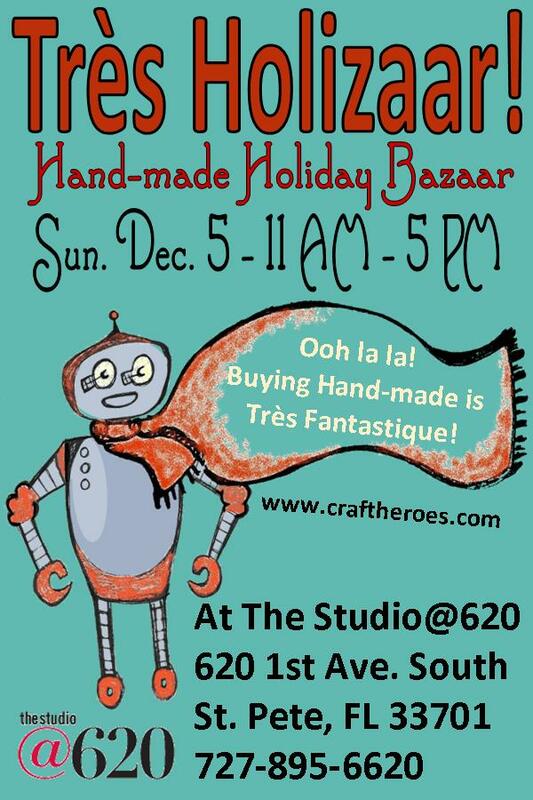 We can't wait to celebrate the holidays with you this Sunday Dec. 5 at Tres Holizaar! Our third annual hand made holiday art and gift bazaar will be held, as always, at The Studio@620, a non profit arts venue located at 620 1st Ave S. in downtown St. Petersburg. NEW this year is live music!! Not one but two fantastic musical duos will perform during the day AND of course we'll have those delicious home made lunches and desserts that will warm you up and keep you energized while shopping. So make a day of it and plan to come out between 11 AM - 5 PM, admission is FREE and you'll go home with great unique gifts and the satisfaction of having helped support The Studio @ 620 and many talented local artists and crafts people. SEE YOU THERE! !